The Roku Streaming Player is a series of set-top boxes manufactured by Roku, Inc. Roku partners provide over-the-top content in the form of channels. A Roku streaming device gets data (the video stream) via a wired or Wi-Fi connection to an Internet router. The data is outputted via an audio cable, video cable or both signals over an HDMI cable. The device can be connected to any television set (or other device) with appropriate input connections. 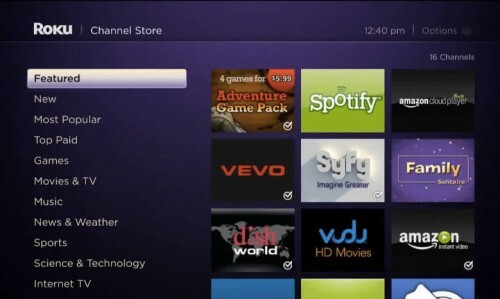 Users can add or remove different channels through the Roku Channel Store. Some games are also available for the devices. Roku announced the first Netflix Internet video streaming receiver box—the Roku DVP—on May 20, 2008. The NXP-powered device runs Linux. 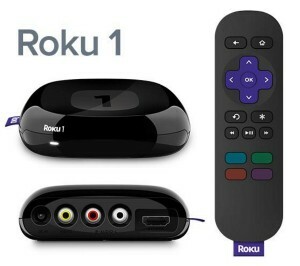 Before Autumn 2010, three versions of the Roku DVP were available: the Roku SD, HD, and HD-XR. The Roku SD only streams standard definition (SD) content. The Roku HD streams both SD and HD (720p) content. The Roku SD and HD both have an Ethernet connection and built in 802.11g Wi‑Fi compatible with wireless b, g, and n routers. Their third box was the Roku HD-XR, which streams both SD and HD (720p and 1080p) content, has built in dual-band 802.11n WiFi support, and has a USB port on the back. Roku revamped its lineup of devices in September 2010. The revised HD became the basic model of the line, offering 720p resolution, 802.11g WiFi reception (as well as an Ethernet connection), and an HDMI output. The middle of the line model, the XD, adds 1080p resolution (if channel programmers provide it), an enhanced remote with replay capabilities, and single-band wireless-n WiFi. The flagship XD|S offers the same feature set as the XD but also adds component video and optical audio outputs, dual-band wireless N, and a USB port for playing videos, photos, and music (USB Playback Support is available as of February 1, 2011). On July 20, 2011, Roku updated its product lineup with three new boxes, each in the same price range as before. However, the Ethernet connection and remote with motion control for games are available only on the XS model. The Roku Game Remote uses Hillcrest Labs’ Freespace motion control technology, so users can control games with natural gestures. The Netflix application was revamped for the Roku 2 HD, Roku 2 XD and Roku 2 XS. The current models now provide the option of subtitles, when the program provides them. The feature “Roku Search” was added on October 29, 2012. This feature allows users to search movie and TV show titles, actors and directors for multiple services on Roku such as Netflix, Amazon Instant Video and HBO Go. The feature is only available on Roku 2, Roku Streaming Stick, Roku LT and HD, due to technical constraints on earlier models. On July 26, 2013, BSkyB launched a Now TV-branded Roku LT, allowing users to stream Now TV content to their television, as well as being able to access content from BBC iPlayer, Demand 5, Spotify and Sky News. The Now TV-branded Roku LT lacks access to Netflix, however. On March 5, 2013, Roku announced the release of their updated media player, Roku 3, with a CPU that’s five times faster than the Roku 2 XS, and a Wi-Fi Direct remote instead of Bluetooth. The Roku 3 remote includes a headphone jack (with headphones provided) for a private listening mode. Roku 3 features an Ethernet port and a USB connection for personal media and a MicroSD card to expand internal storage. 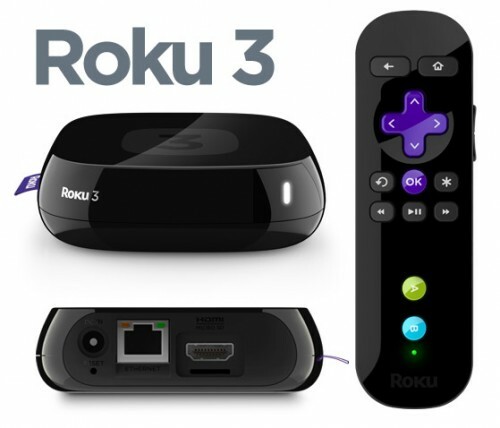 Roku 3 has an enhanced remote with headphone jack and motion-control (uses Wi-Fi Direct) Streaming player includes IR receiver (compatible with various universal remotes). Content on the Roku DVP is provided by Roku partners, and are identified using the “channel” vernacular. Each separate channel supports content from one partner though some content partners have more than one channel. Users can add or remove different channels from the Roku Channel Store. In May 2011, Roku stated the DVP had over one million viewers and had delivered 15 million channel downloads. Both on-demand content and live streaming are supported by the devices. For live TV streams, Roku supports Apple HLS (HTTP Live Streaming) adaptive streaming technology. The primary movie channels which are available on Roku in the U.S. market are not availabele outside the US. The Roku is an open-platform device with a freely available SDK that enables anyone to create new channels. The channels are written in a Roku-specific language called BrightScript, a scripting language the company calls “similar to Visual Basic”. Developers who wish to test their channels before a general release, or who wish to limit viewership, can create “private” channels that require a code be entered by the user in the account page of the Roku website. These private channels, which are not part of the official Roku Channel Store, are neither reviewed nor approved by Roku. In order to access British American channels overseas on Roku, you need to appear to have either a UK or US ip address, and an account for each region. Sign up for a new Roku account AFTER using one of the two methods below. If you sign up for a Roku account while appearing to be from a non – UK or US locations you will not be able to access channels from these countries. Setup your network, Not the Roku Player, they have limited Network configuration options. Login with your British American Roku account.